Unique combination of purified ox bile and standardized ginger extract. 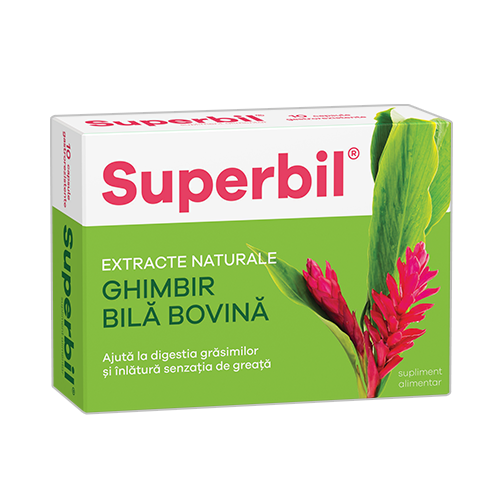 The purified ox-bile extract complements the amount of acids and bile salts and in the same time improves bile drainage and expulsion. Ox bile extract improves the emulsifying and resorption processes of lipids and fat soluble vitamins. Moreover, it stimulates the activity of intestinal and pancreatic enzymes involved in the digestion of fats. The extract of ginger standardized in gingerol stimulates the digestion and contributes to the decrease of abdominal bloating due to its antiflatulent and carminative properties. The ginger dry extract also reduces nausea.